Everything you do in life is determined by the quality of your thinking. If you aren't thinking clearly, you're at the mercy of everyone else-from dishonest politicians to aggressive, stop-at-nothing ad agencies. Unfortunately, many people never give any thought to how they think. No wonder they're susceptible to the frustration, pain, ineffectiveness, and financial loss that result directly from poorly considered thinking. Critical Thinking is about becoming a better thinker in every aspect of your life-as a professional, as a consumer, citizen, friend, parent, and even as a lover. 103B Critical Thinking: Tools for Taking Charge of Your Professional & Personal Life - Second Edition $22.49	 Qty. Drs. Richard W. Paul and Linda Elder, leaders of the Center for Critical Thinking, identify the core skills of effective thinking, then help you analyze your own thought processes so you can identify your weaknesses and overcome them. As you learn how to think more effectively, you’ll empower yourself as never before, discovering new opportunities, avoiding disastrous mistakes, and gaining new clarity throughout your entire life. The six stages of thinking: which stage are you in? Discovering where you stand in the hierarchy of effective thinking. Getting past the egocentrism and sociocentrism that shackle our progress. Imbuing our thinking with clarity, relevance, logic, accuracy, depth, significance, precision, breadth, and fairness. Overcoming the unique obstacles to effective thinking in businesses and organizations. Directing your thinking towards your most important goals and purposes. Assessing matters of fact, matters of opinion, and matters of judgment. Applying critical thinking to life’s key decisions. Why thinking and character are inextricably linked-and how to become a more ethical thinker. Ch. 5: The First Four Stages of Development: What Level Thinker are You? Caught in the maelstrom of life? Looking for a way to make sense of the chaos enmeshing you? Critical Thinking: Tools for Taking Charge of Your Professional and Personal Life provides a method for unraveling the complexities of life and reweaving them into an integrated tapestry which gives meaning and purpose to the life of the individual and his/her relation to others. 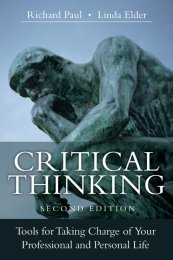 This book is a natural correlative of a previous book by Paul: Critical Thinking: What Every Person Needs to Survive in a Rapidly Changing World. However, the current book is not about ‘survival’ but about ‘taking charge’. It deals with the fundamentals of critical thinking and their necessity and applicability in making the decisions which give direction to one’s life. It’s a book of questions, not answers, questions about one’s thinking which as Paul and Elder state in a graphic, pg 45, “your thinking controls your emotions and your decisions”. This book not only presents a mirror in which to see oneself through questions, but also presents the challenge to look honestly into the mirror with the view to improve the image. Critical Thinking: Tools for Taking Charge of Your Professional and Personal Life is written in a readily understandable and easily readable style. This is a book for Everyman. It is a book not only to be read, but lived. Rev. Robert J. Schlim, S.J. Paul and Elder’s “Critical Thinking: Tools for Taking Charge of Your Personal and Professional Life” provides the key to developing ones mind as an active tool for quality thinking and ultimately better decision-making in professional and personal life. This book explicates the difference between quality thinking in professional practice and flawed thinking. The authors challenge a personal self-examination of the quality of the reader’s thinking with activities that are insightful, cognitively interesting and structured so each component of thinking is enhanced. The approach is practical, and meaningful for the reader interested in developing as a critical thinker. Paul and Elder’s expertise in dealing with the complexity of thinking needed to survive in society today is illuminating. As a nurse leader working in a chaotic health care system subject to constant change and revision: critical thinking is the answer to implementing an improvement in health care delivery. The authors have unlocked the mystery of improving my thinking for quality decision-making in my nursing practice. The more I work with these ideas for improving the quality of my critical thinking and decision-making in nursing practice the more empowered I am as a person and professional nurse.